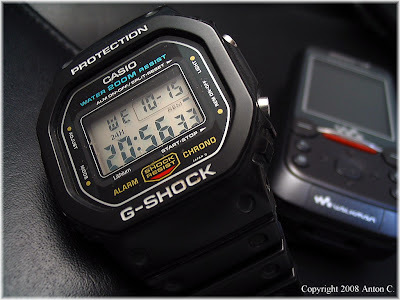 I am selling one of my DW5600C vintage G-Shock to fund the purchase of some camera gear. For more information about this watch, read here. There are scratches on the crystal, significant dings on the crystal too. This watch had seen time. Rate at about 80%. There are some light scratches on the caseback, the bezel screws are all present, and the case is clean. The strap and bezel are original and are in good condition surprisingly, with some light marks visible, keeper is present and intact. Someone was selling the DW5600C on the watch forums at a crazy price of USD400 sometime ago. I just want USD108 for this piece. You have to pay shipping. Let me know your location and your preferred shipping method to check how much more you gotta pay for shipping. I ship either by Singapore Post Registered Airmail (cheap but slow), or Fedex (fast but expensive). I accept Paypal and I will bear the fees. If you don't have Paypal, I also take Western Union Money Transfer, but all fees will be borne by you. There some really crazy G-Shock fans out there, you guys know yourself. Fess up! And among this group, some really die hard fans of the DW5600 styles. I personally like the classic DW5600C very much. 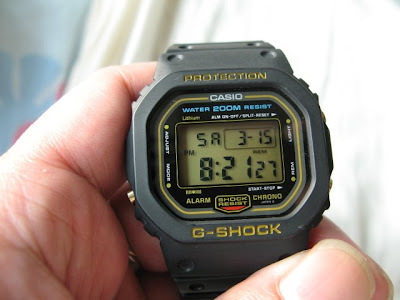 The DW5600C was produced from June 1987 to June 1996, it is one of the most iconic G-Shocks, and it is the last basic G-Shock with the screw back and full metal case. In other words, its built like a tank. 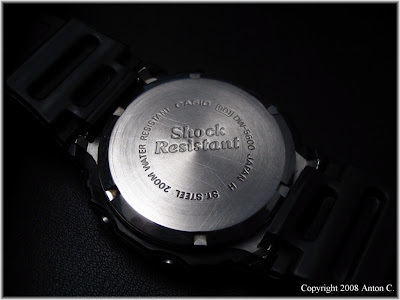 In comparison, the contemporary version; denoted as DW5600E, uses black composite plastic instead for the case, and the steel back is secured on with 4 tiny screws. While it is still tough, its just no longer the same. A yellow DW5600C, photo courtesy of Mike (OldHippie on watch forums), used with his kind permission. The rarer DW5600B-3V (green) and blue DW5600B-2V (blue), photo courtesy of Wah (Wah_Wah_Wah on watch forums), used with his kind permission. The DW5600C is most common in black resin, though it's also available in yellow, and the even rarer blue and dark green. 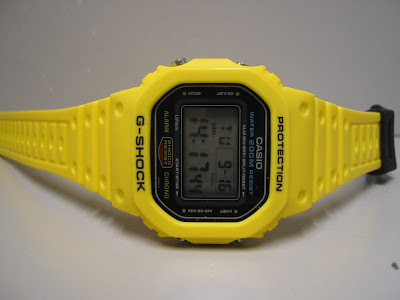 And within the black version, there are the 'gold black' version, where everything is essentially the same except for the following cosmetic differences; buttons, screws and strap buckle are gold plated, and on the dial; instead of a silver color border, it has a yellow color border. Lastly, the words on the bezel are yellow instead of white. The 'black gold' version DW-5600c-9CV, photo courtesy of Wah (Wah_Wah_Wah on watch forums), used with his kind permission. 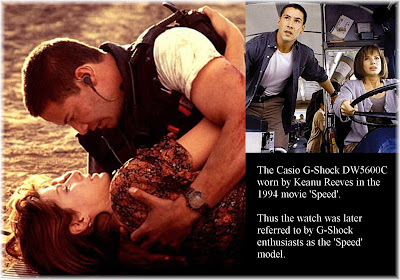 The standard black version was worn by Keanu Reeves in the 1994 movie 'Speed', thus the watch was later referred to by G-Shock enthusiasts as the Speed model. It is also known as the NASA model, because its worn by NASA astronauts and it is one of the four watches certified by NASA for space flight missions. 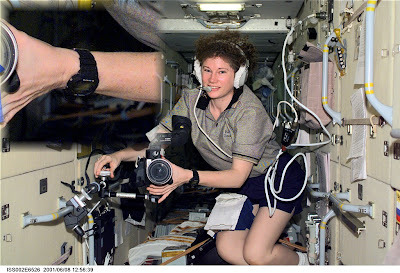 The DW5600C on the wrist of astronaut Susan J. Helms, Expedition Two flight engineer, this is just one of the many pictures you can find of astronauts wearing the DW5600C. Its well known among my watch enthusiast friends that I am a space watch fan, so I focused mainly on the standard black versions used by NASA. I can't see myself wearing the bright yellow version anyway, and the blue and green are too out of reach. There are different versions of the watch just for the black version alone (this applies both on the standard black and the gold black), and this is what confuses some enthusiasts. The DW5600C is available in two modules; 691 and 901, and both were produced in two factory locations; Japan A and Japan H.
1)Module 901 has a slightly brighter light than module 691. 2)Model 691 uses the bigger CR2320 batteries where model 901 uses the smaller CR2016 batteries. 3)The module 691 will always have with mirror polished casebacks while module 901 will have casebacks with a 'milled ring' surface. Compare them in the following two pictures. Module 691, Japan H left, Japan A right. Module 901, Japan A left, Japan H right. As for factory locations, it appears that Japan A produced better quality. 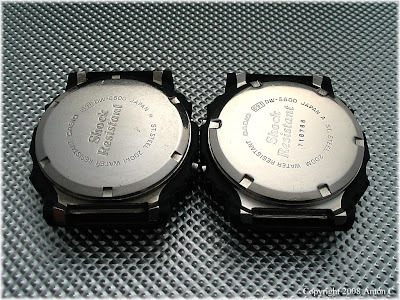 Regardless of module 691 or module 901, the DW5600Cs from Japan A always has a serial number on the caseback, whereas for Japan H, there are no serial numbers on the casebacks. 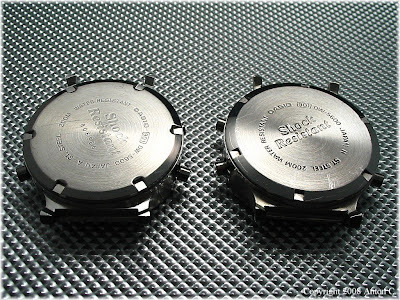 The lugs of the watch cases are different; Japan A is more refined with the sharp edges flattened and polished, but Japan H lugs remains sharp and unrefined. And the case shape is different too; look at the sloops from the case down to the lugs, Japan A (left) has gentle and slopped steps, while Japan H (right) has crude and steep steps. It would seems that Japan A pieces exist in lesser numbers and hence are more sought after by collectors. 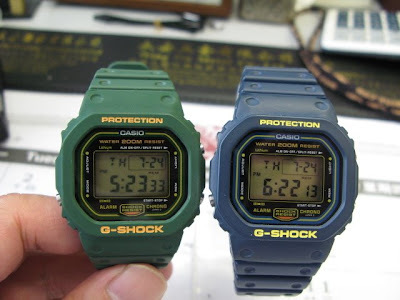 As for the modules; 901 were produced for only 4 years before Casio stopped making these watches, but the 901s appear more often. 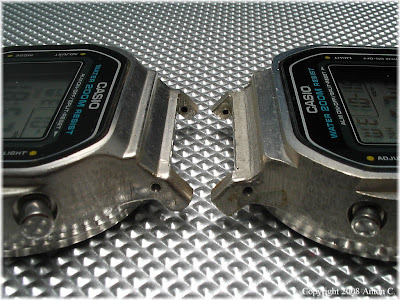 It could be that Casio increased production during the period they produced the 901s, or it could be that the 691s are just older and a normal user would probably just dump them after wearing for a few years, thus they got rarer. These watches are easily availably on Ebay in various conditions, most looks beaten but occasionally a good condition one will appear. 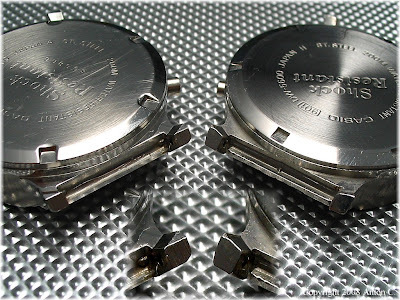 Missing strap keepers are common and it seems that the bezel succumb to resin rot more easily than the straps. 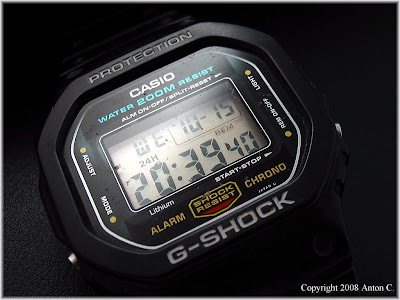 One thing to note is that condition of the bezel and strap are not important because you can easily purchase a brand new original bezel and strap from Casio or on Ebay (sometimes they are sold with lug screws, springbars and gasket too). In fact many were sold on Ebay without bezel or even strap. What is important is that the watch works, the light is still working, and the four lug screws securing the bezel are intact, because these lug screws can be hard to source. I hope these information will be useful to fellow enthusiasts.